MissMuffcake: [day 7] Snack Time! 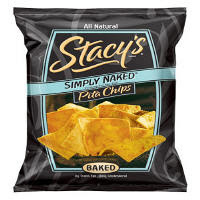 A few weeks ago I discovered Stacy's Pita Chips while trying to find a snack while shopping. I was limited and after searching in the aisle of the store both on the shelf and on my phone (seeing what vegan options I could find on my browser) I decided to try them and since then I have been hooked. Q: Are Stacy's Pita or Bagel Chips vegan? A: Stacy's currently has the following vegan products: Stacy's Multigrain Pita Chips, Stacy's Simply Naked Pita Chips, Stacy's Italian Harvest Pita Chips and Stacy's Veggie Medley Pita Chips. Go pick up a bag today, especially the Italian Harvest flavor!